Dated English Delft Plate, 1724, initialled, B. I. A., with triple flower display, within simple diaper border, 8¼“. Tiny rim chips. See – Dated English Delftware, Lipski & Archer, pg. 82. Fig. 328. The Frank P and Harriet C. Burnap Collection of English Pottery, Ross E. Taggart, pg. 56. 153. 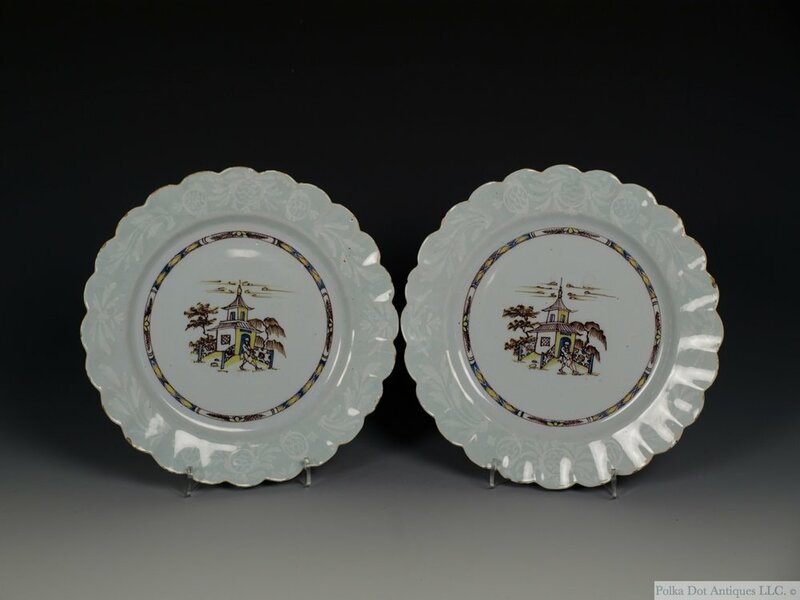 Pair of Bristol Delft Plates, c.1760, (probably Redcliff Back, Richard Frank) Bianco-sopra-bianco leaves and pine cone borders, with polychrome painted a Chinese figure in front of a pagoda within a narrow trellis and foliate band, 8½.“ Minor glaze chips to edges. See – Delftware, The Tin-Glazed Earthenware of the British Isles,Michael Archer, pg. 162. No: B.88 & col. pl. 85. English Delftware in the Bristol Collection, Frank Britton, pg. 268. Pl. 16.36. Also - Colonial Williamsburg – Acc. No. 1955-216,1. Tin-glazed earthenware (delft), Ca. 1765, England, Bristol (probably). Large plate-shaped dish with slightly fluted scalloped rim and incised foot ring. Blue tin glaze decorated with a Chinese figure standing in front of a pagoda encircled by a narrow band of trellis diaper and floral sprays; outlined in manganese and shading in blue and yellow. On the rim, two large pine cone and leaf sprays in bianco-sopra-bianco; three stylized sprays in blue on the reverse. Delft plates with the same pattern seen here, but with plain edges, bear the dates 1763 and 1764. Examples with the same scalloped rim and Bristol-style bianco-sopra-bianco decoration, but with different central scenes, are dated 1761 and 1762. Liverpool Sadler Transfer Printed Delft Tile, 1770-80, printed in black with ‘Peasant Family With a Cradle’, a man leaning on a stick over a woman seated with a child, a craddle at her feet, in front of a house with smoking chimney, applied paper label, Hodgkin Collection, 5 1/8 “ Sq. Very minor glaze chips to edges. See The Norman Stretton Collection, Phillips , London, 21st February 2001, lot – 365. For a similar tile see, Anthony Ray, English Delftware Tiles. no. 723. And John Bowles drawing book, 1756-57, fig. 59 for an illustration. Note – The Hodgkin family collection was one of the finest collections of delftware tiles ever made. Initially developed by John Eliot Hodgkin, and first published in the Burlington Magazine in 1905, later developed into a book written by John and his daughter Edith, the collection was carried on by John’s son Stanley Howard. The collection was eventually sold by Sotheby’s in 1950 and 1951. Liverpool Sadler Transfer Printed Delft Tile, 1765-75, printed in red, with ‘The Village School’ a male seated on a bench in front a table with three children, 5”. Some glaze chips to the surface and edge. For a similar tile see, Anthony Ray, Liverpool Tiles. no. D5-19. Micheal Archer Delftware, Pg. 522. N.480. Liverpool Sadler & Green Transfer Printed Delft Tile, 1765-1775, printed in red with a religious scene of a woman at a well with a male figure, applied paper label, Jonathan Horne Antiques, 5”. Some glaze chips to edges. See Anthony Ray, Liverpool Printed Tiles. Pg. 36. D1-4. “The design is from an engraving by Carlo Maratta after Annibale Carracci (Trans. E.C.C., Vol. 5, Pt. 2, Plate 79)." For a similar example see – Anthony Ray, ‘English Delftware Pottery in the Robert Hall Warren Collection, Ashmolean Museum, Oxford. Pl. 89. Illus. 182. English Delftware Oval Potting Pot, 1760-70, probably London, hand painted with a chinoiserie pattern of a building with a fence, 4¼" long. Minor glaze loss to rim. For a similar illustration see, British Delft at Williamsburg, by J. Austin, illus 403. English Delftware 'Flora' Plate, 1735–1740, probably London or Bristol, in cobalt blue with a Chinoisere style decoration of a European scene of Summer ( Fecundity or Felicity ? ), seated on a rock, 8¾". Minor edge chips and glaze chips. For an identical plate see, ‘English Delftware in Bristol Collection’ by Britton, Illus, 19.22. Bristol Delftware Plate, 1740-50, a lavish blue floral basket of flowers within a manganese ground with Fleur de Lys and shells in reserves, 11 5/8". English Delftware Plate, c.1770, decorated with a farmer and his wife, in a landscape, 9½“. For an identical illustration see ‘British Tin-Glazed Earthenware’ by Black. P.26. English Delftware Chinosiere Blue and White Dish, c.1750, depicting a man holding a staff courting a lady on a balcony, 8 3/8".